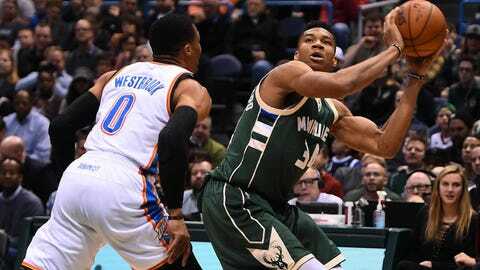 MILWAUKEE — The defending NBA Most Valuable Player and one of his top challengers will face off when Russell Westbrook and the Oklahoma City Thunder travel to face Giannis Antetokounmpo and the Milwaukee Bucks on Tuesday night at the Bradley Center. Antetokounmpo has been dominant through Milwaukee’s first six games this season, averaging a league-leading 34.7 points with 10.7 rebounds and 5.5 assists per game. He scored 30 points or more in five of Milwaukee’s six games this season. Antetokounmpo is the first player in NBA history to average at least 34 points, 10 rebounds and five assists through the first six games of a season. Antetokounmpo scored 33 points with 11 rebounds in the Bucks’ 117-106 victory over the Atlanta Hawks on Sunday. He set the tone early, scoring Milwaukee’s first nine points over a three-minute stretch. Westbrook is coming off a big game as well. He had 12 points, 13 rebounds and 13 assists for his third triple-double of the season in a 101-69 thrashing of the Bulls on Saturday in Chicago. Even though Westbrook led the league with 42 triple-doubles last season en route to MVP honors, Thunder coach Billy Donovan cautions against taking the guard’s talents for granted. Westbrook is just the third player in NBA history to record three triple-doubles in the first six games of a season. Oklahoma City, wrapping up a three-game road trip but in the middle of a stretch of six road games in a seven-game stretch, comes to Milwaukee in good health. The Bucks, meanwhile, will have to go without center Greg Monroe, who is out for at least two weeks with an injured left calf. Monroe was bothered by the calf in training camp but appeared in all six of Milwaukee’s games, averaging 6.8 points off the bench. John Henson filled Monroe’s role Saturday, scoring 12 points with nine rebounds over 28 minutes. He will share time at center until Monroe returns. “We’re going to need (Henson) to step up, him and Thon (Maker) and D.J. (Wilson) and Giannis will all see some action at the five,” Bucks coach Jason Kidd said. The Bucks (4-2) and Thunder (3-3) split their series last season.